Most modern homes have prefabricated (prefab) fireplaces that connect to prefabricated chimneys. A prefab chimney is constructed of a metal pipe that runs up above your roof and allows exhaust gases to exit your home. The easiest way tell if you have a prefab chimney is just to look. If, roughly over your fireplace, you have a metal pipe coming up out of your roof and you do not see a brick chimney, then you have a prefab chimney. You can also look inside your fireplace to determine the type of chimney you have. If the top of your fireplace is connected to a metal pipe, then your chimney is going to be a prefab chimney. A prefab chimney does not require a flue liner and connects to only one appliance. For this reason, modern homes often have multiple steel pipes on the roof. Prefab chimneys require a specific style of chimney cap dependent upon the type of piping used for the chimney. There are two main types of piping - solid insulated or air cooled. Air cooled chimneys are comprised of a larger pipe with a smaller pipe inside and has an open gap between the two pipes. For air cooled pipes, be sure to use a cap designed to allow that air flow to continue unhindered. Solid insulated pipes can use standard caps. The Vacustack Cap provides unparalleled protection from wind induced down drafts. It is available for both solid pipe and air cooled chimneys. For those who are experiencing downdrafts and back-puffing with your chimney, this is the solution. 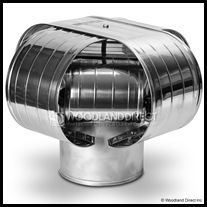 The Weather Shield Cap protects your metal pipe chimney from the elements and from critters looking for a home. 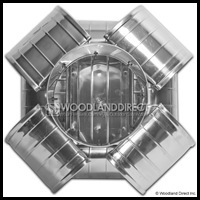 The Weather Shield is available for both solid pipe and air cooled chimneys. If you are looking for a replacement chimney cap for your metal chimney, this is the right category. We have chimney caps for solid pipe and air cooled chimneys of all makes and models. These chimney caps are constructed with stainless steel, so you won't have to worry about corrosion and rust through. Chimney surrounds are a great solution for covering up that big metal chimney pipe sticking out of your roof. Eliminate that eyesore and increase the property value of your home. Chimney surrounds are durable, easy-to-install, and look like a real chimney. 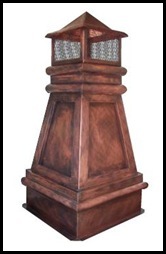 The chimney surround and the top & trim kit combine to create the entire chimney surround unit. The Gelco chimney cap is designed with the discerning, budget conscious homeowner in mind. Created for those who not only want to protect their homes but ensure they remain attractive as well. The classic design of Gelco chimney caps compliment any home and are always reasonably priced, which is why they remain a top seller among chimney cap counterparts. Gelco chimney caps are available in a variety of finishes to match your homes design; including stainless steel, copper, and black galvanized. The wide range of sizes ensures that you will be able to find just about any size you need to fit securely on top of your homes chimney flue. They are available in single-flue, multi-flue, and easy-clean designs to allow the perfect fit for your chimney. Installation is easy with caps that mount directly to the chimney crown or chimney flue using cement fasteners, adhesive, or specially designed pressure screws which are included with the cap for easy installation. These innovative chimney caps include a nut that is welded on the frame to ensure a solid mount and guarantees that the threads won’t strip during installation. Constructed of exceptional quality materials, each cap also comes complete with screen mesh. For additional product assurance, the Gelco chimney cap comes with a manufacturers lifetime warranty against manufacturing defects and rust. 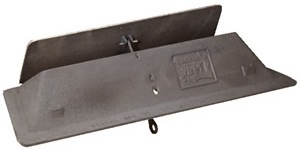 Save Money By Replacing Your Fireplace Throat Damper With A Top Sealing Chimney Damper! Tuesday, October 12, 2010 0 comments Posted by Stephanie H.
Fireplace throat dampers are used to regulate the flow of air from inside your home from moving up the chimney and being released outside. 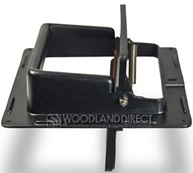 They are usually made of a cast iron plate that can be opened or closed with the help of a lever or handle. However, even the top-of-the-line plates do not hold a strong seal and you can lose valuable energy. Recent studies have shown brand new fireplace throat dampers can leak up to $200 worth of heating and cooling per year. Imagine what you may be losing with that old rusted throat damper that you have been meaning to replace. Do yourself a favor and start getting the most out of your home’s energy source - convert your fireplace from a throat damper to a top sealing chimney damper. Top sealing chimney dampers create a tight fit on the flue to ensure that your conditioned air cannot leak out through your chimney. They have been proven to be up to 90% more efficient than the traditional fireplace throat dampers. There are a few different models of chimney top dampers to choose from – the most popular being the Lock-Top and Lyemance brands. 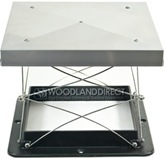 The Lock-Top chimney damper is constructed of a stainless steel lid that is attached to a cast aluminum frame by stainless steel springs. The Lock-Top chimney damper also features a safety device that will automatically lock the damper so it will stay open in the case of a chimney fire. The Lock-Top II chimney damper is complete with an included chimney cap and your choice of a 3/4” or 5/8” mesh animal guard. The Lyemance energy-saving damper is made out of solid non-rusting aluminum and features a silicone rubber seal that creates a tight hold at the top of your flue. Opening and closing your top sealing chimney damper is a breeze with the long cables that are threaded down the flue and mount with the handle to the inside of your firebox. The Lyemance damper is also available for round flues. Whether you are heating or cooling your home, the top sealing chimney damper will act as a storm door to keep that expensive conditioned air inside your home where it belongs. Start saving your energy dollars - replace your fireplace throat damper with a top sealing chimney damper! Monday, August 10, 2009 0 comments Posted by Stephanie H.
How difficult is it to install a chimney cap and is it a project that should be taken on by the typical homeowner? This question can be easily answered by asking another question. How easily can you gain full access to the top of the chimney? A difficult to reach chimney crown can render the easiest of chimney cap installations impossible for a typical do-it-yourselfer. Even when the chimney top is reasonably or even easily accessible, getting to the top of a chimney can be the hardest part of the job. It’s often been said with regards to heights and ladders: it’s not the fall that is the problem, but rather that sudden stop at the bottom. For some safety tips from the leading authorities on ladder safety, please click here. 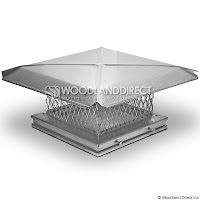 Single Flue Cap – A single flue cap sets over a flue tile like a shoe box lid. You simply seat the cap on the flue tile and tighten the bolts. You will tighten the bolts using either a screw driver or a socket set. 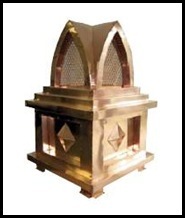 Top Mount Chimney Cap – This style cap is secured to the top of the chimney using masonry screws. First, you seat the chimney cap in the appropriate position and then mark the position of the holes with a marker. Then remove the cap and drill the holes. Reseat the cap and then secure it using the masonry fasteners, which are typically provided by the manufacturer of the cap. Outside Mount Chimney Cap – These caps have skirts that hang down over the side of the chimney. If installing on a 2x4 wood construction chimney, you will screw through the skirt until you tap into the wood under the chimney’s finish exterior. Provided you are fastening to a brick and mortar chimney you should line your hole up with a mortar joint and secure this cap using masonry fasteners into the mortar joint. You can fasten into the face of a brick or stone, but drilling into this material is difficult and time consuming. · Roofers – These contractors will have the equipment and tools to get the job done. · Handyman – Installing a chimney cap is a quick project that most will be glad to handle for you. Saturday, July 11, 2009 0 comments Posted by Stephanie H.
There are many reasons you may be experiencing troubles with smoke downdraft in your chimn ey, but the most commonly known are wind-induced downdraft due to hills, mountains, and tall buildings nearby. Also, there can be downdraft if there are tall trees located near the chimney. Vacu-Stack chimney caps are used to help eliminate any of these wind-related problems that may cause back draft in your chimney. Back draft or down draft is any smoke/gas that becomes backed up in your chimney from burning a fire and cannot be properly vented. Simply put this is how it works - when wind flows around the Vacu-Stack its velocity increases, which increases the pressure in the area. The result of this creates a partial vacuum. This vacuum helps to pull any gases that are in the chimney up and out, which will prevent any downdraft from occurring, no matter what direction the wind is coming from. The Vacu-Stack chimney caps are available in a 26 gauge alloy stainless steel and in copper, and are made in the U.S.A. These caps are so well made that they are even backed by a lifetime warranty! It also functions as a normal chimney cap – keeping debris, animals, rain, and snow out of your chimney. 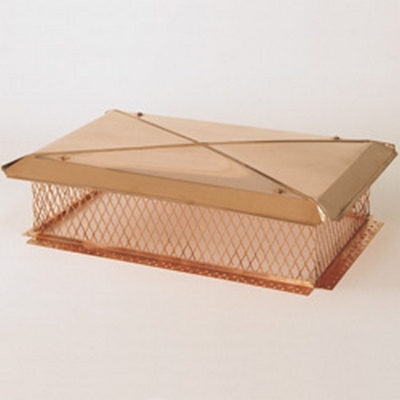 The Vacu-Stack is the premier chimney cap for solving most wind-related draft problems! Wednesday, May 27, 2009 0 comments Posted by Stephanie H.
Most homeowners see the business end of a chimney as the hearth. After all, this is the part that throws off warmth and adds visual ch arm to the interior of a room. Architects and builders; however, regard the chimney top with equal importance. The chimney top is usually the tallest point on the house and is often a home’s visual pinnacle. One of the best ways to visually enhance the chimney top is to add a chimney pot. Chimney pots have been around for hundreds of years. First as a necessity in that they extended the exhaust point of fireboxes which often burned coal. Later as chimney pots became the standard for chimney tops, they became a status symbol. At one time, England even had a special tax just for chimney pots. Likely brought to America by French and English settlers, the chimney pot has a prominent place in the design and construction of distinctive American homes and estates. As home science and building techniques advanced, functionally, the ne ed for chimney pots was eliminated. The advent of zero clearance or prefabricated fireplaces as well as the use of round metal exhaust pipes for furnaces and other appliances offered a functional albeit unsightly alternative to the beloved masonry chimney and the ornamental chimney pot. But what may have been functionally acceptable was not esthetically pleasing and homeowners are turning to the chimney pot as a way to not only cover but enhance their chimneys once again. Chimney pots come in a variety of materials including iron, cast cement, and copper. The latter being the most popular due to its versatility and distinctive look. Many homeowners have custom copper pots made to include architectural features of their homes. They are placed as stand alones atop a chimney or in clusters on a multi-flue crown. Considering most are made using time honored crafting techniques, these are affordable, easy to install, and made to last a lifetime.